There is hardly a finer feeling than being outside at a flea market or rummage sale on a beautiful day and finding a great deal on something lovely to bring home. Finding used items is not just about saving money – though that’s wonderful, too. 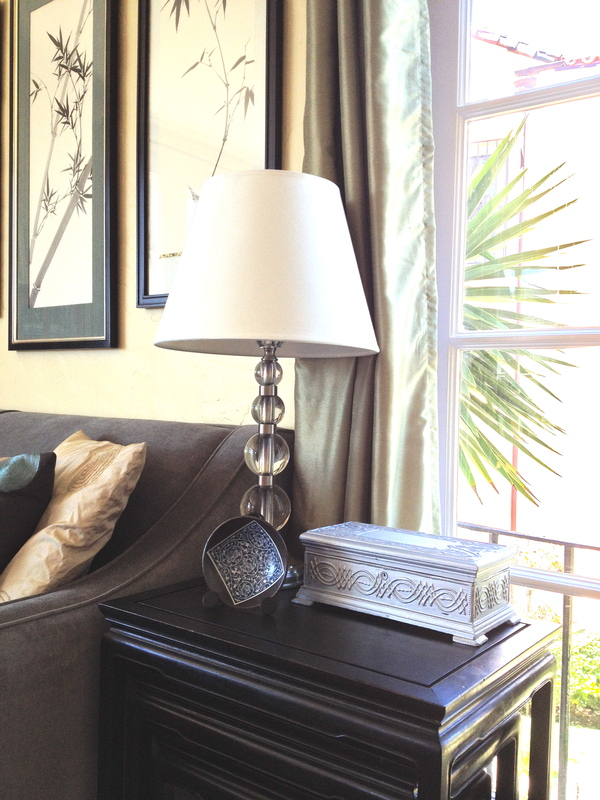 It’s also about the personality and dimension that a mix of old and new things can bring to your space. Today is one of those rare and perfect San Francisco Saturdays, when the sun is bright and hot, and there’s just a gentle spring breeze in the air. We took a family walk out to our neighborhood rummage sale. They call it a “collectibles” sale, but I think that’s a bit generous. The older boys brought their wallets, dreaming of a great Beyblade (if you have no idea what that is, just ask any five- to ten- year old boy!) or Lego find in the toy section, so we all felt the anticipation! We stopped at a fountain along the way, and our oldest shared his pennies, so they could make a wish. When we arrived at the park for the sale, the boys were in and out quickly, after determining there were no Beyblades to be had. They did indulge in some muffins and lemonade from the bake sale, though. Our oldest later reported that he felt very grown-up, purchasing his own snack and that it was a very satisfying outing for $2.02 (the $.02 having gone into the fountain). Hubby spotted these vintage board games in the toy section for $1 a piece, and they look ultra cool. They’re dated 1960 and 1958. Here they are on the game table in our den. Can’t wait to try them at a family game night! 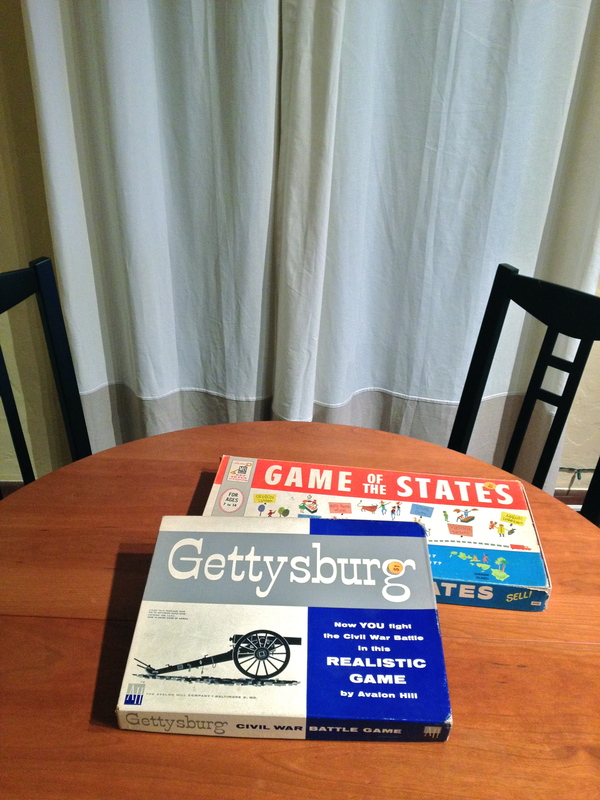 Game of the States from 1960 and Gettysburg from 1958 for $1 each! Looking forward to playing these! Now to my treasures! Nothing big, but I’ve been looking for accessories for our living-dining room, and it was a great place to pick up a few inexpensive items that feel like they have a story behind them. 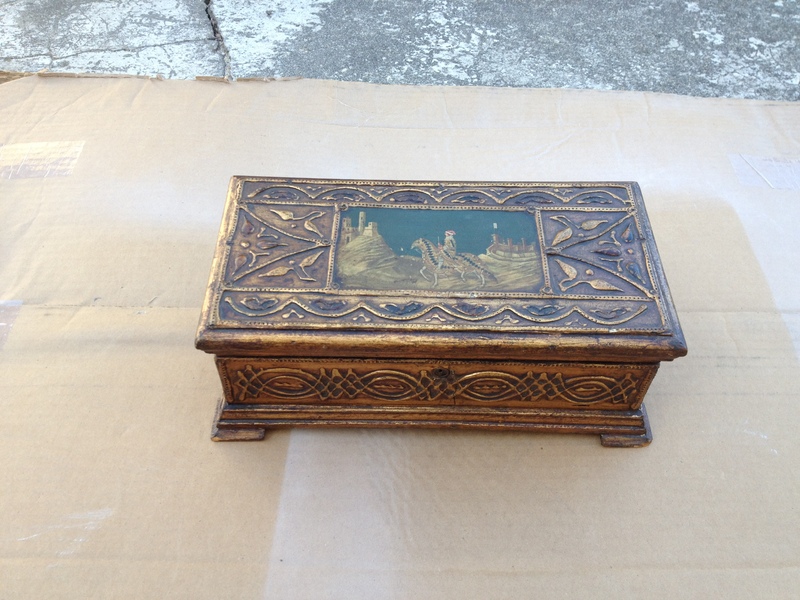 $5 for this decorated wooden box with a little key. The metallic spray paint gives a great glow very quickly! 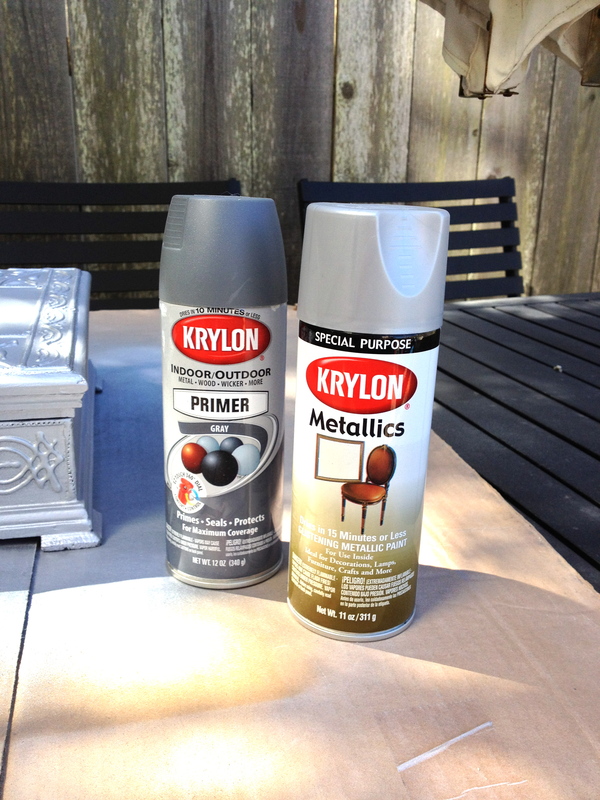 I used Krylon grey primer both for priming and a very light dusting over the silver, to give it a more aged look. The silver paint is very shiny! 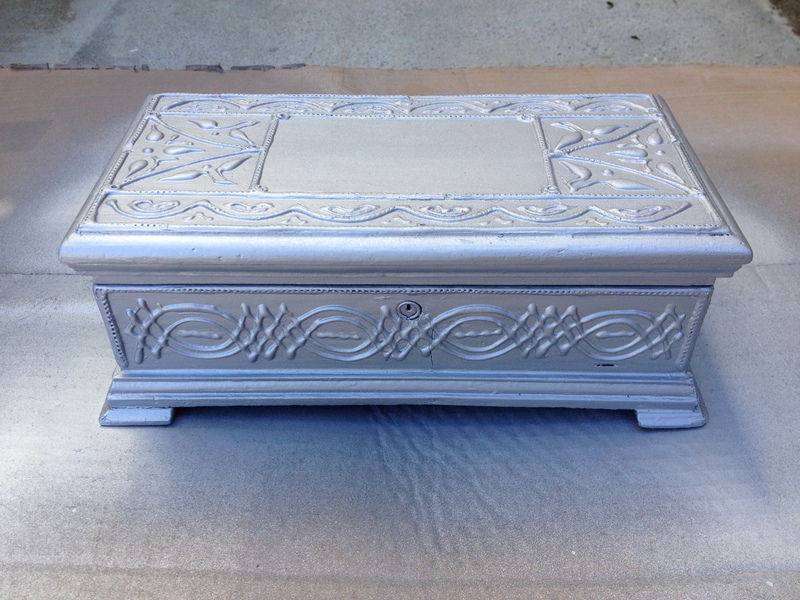 The new-old silver box on the nesting side tables in our living room. Not sure how long this vignette will stay safe from toddler curiosity. 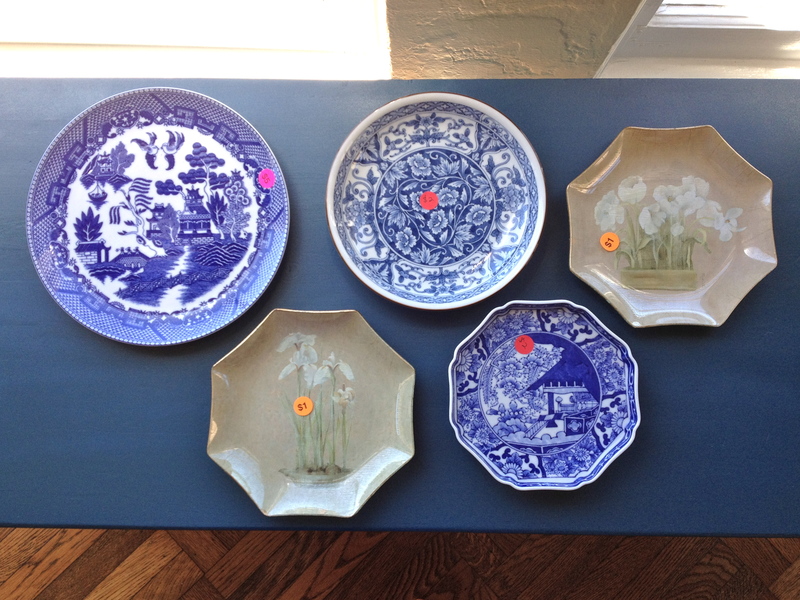 Total of $11 for these five plates. They will hang on the wall in the dining room. Today was a ton of fun, but for serious treasure hunting, you cannot beat the Alameda Point Antiques Faire, held the first Sunday of every month. It’s enormous, with row upon row of serious antiques vendors. I went on January 1 this year with a friend, and it was a wonderful start to the year, wandering in the fresh air, enjoying the view of San Francisco, gnoshing on Jamba Juice and kettle corn, and striking bargains! We plan to go back in May, and I’ll be sure to let you know how it goes! Click the picture for the Alameda Antiques Faire website.